The game making its IpBoG debut this week was Hey, That's My Fish! A deceptively cute game where you're penguins trying to get the most fish. But whilst also drowning your opponent's penguins. It turns out penguins are nature's assassins. Libertalia made its return to IpBoG, a game that I claim is like Citadels although Alex disagrees. I got off to a strong lead in the first week, and did pretty well in the second. Dan did much better than me in the final round but didn't manage to take the lead. For some reason I enjoyed this game a lot more this time round than the previous time. 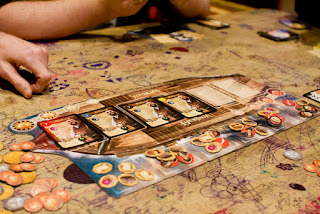 Afterwards we played some Race For The Galaxy. Dan found the game familiar but couldn't remember playing it before. At least that's what he claims, maybe he was just hustling us because he won the game with ease. After that we played a quick game of For Sale which is fast becoming a firm IpBoG favourite. 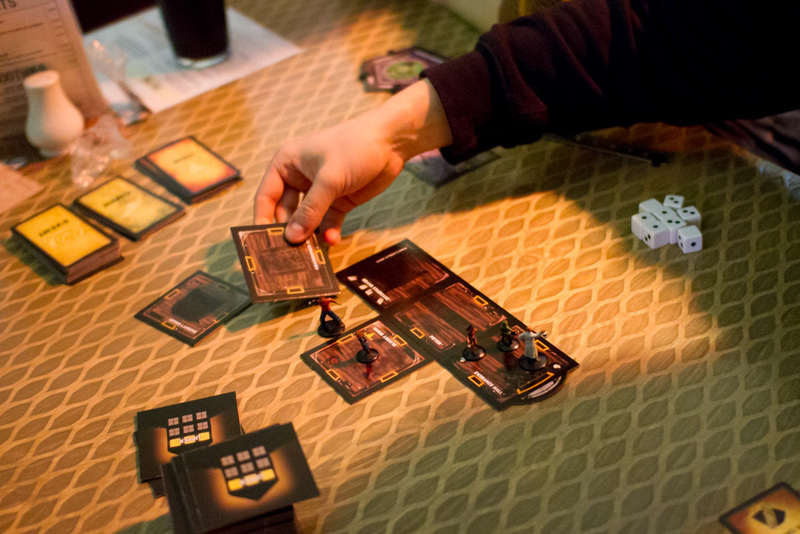 On other tables there were games of Betrayal at House on the Hill, Splendor and Spyfall. I finished off the night with Codenames and I think we finally got the game. Previously I think most people had felt pretty indifferent about it but at the same time felt there was potential. This was my third play of it and it really clicked this time. The spy masters seemed much better at thinking up clues that could apply to three or four words which is really what the game is about. It shines when there are multiple possibilities and you have to try and work out which are the ones that you should be choosing. Although in one of our games the first word guessed for the first clue was the assassin card, losing the round for that team.